Baldeagle wrote: The battery was the same one on the bike when the old rectifier was fried. It was advertised as "fully charged and ready for use", but I checked the voltage before fitting and it was 12.6 v.
12.6 volts was too low for a new, fully charged battery of this type; it was not fully charged when installed. And after you have effectively recharged it by running your engine, the 12.6 value seems even more so too low. What is its current voltage after the engine has stopped and the battery has just sat for about two hours or more, but before the ignition switch is turned on again? "There are three types of alternator failures: short, open (wire burned out), or loss in rotor magnetism. A short or open ... will result in either a low output, or no output at all. A loss in rotor magnetism ... will result in low output." Baldeagle wrote: ... a fully charged battery (13.4 volts), was used. I was wrong thinking lack of a full charge was the problem in your case, but the 13.4 volt value looks like that of a battery whose voltage has not stabilized yet. Let it stabilize, and measure again, please. Bill might want to also look at the nearby thread on battery basics for the "gel" case, as well as the AGM thread, too. All, please help Bill find a premium battery from his local dealer. Next would be to check the resistance of the coil in the rotor; you have two now because you have two alternators; you could compare. The VRR has a rather fixed-voltage power source available to it. If said rotor resistance is too low, when the VRR sends electric current to the rotor, it sends too much. That causes too much "magnetism" in the spinning rotor, which causes the alternator output to be too high. A coil is not a brush. I think our earlier rotor contains one coil. Bill might first practice by measuring the rotor coil resistance on the new alternator that he has arriving. If Bill's present (or older) rotor resistance on the Pan is found to be down under say, about 1.0 ohm, that may be the cause of the high running voltage even though the manuals do not say so; they just say the resistance should be in the range from 0.0 to 4.0 ohms. The advantage of going that route is that Bill finds something amiss with his alternator, something that might cause high output, before replacing the alternator. David W wrote: [... Specifically, the resistance of the coil in the rotor may be abnormally low. The following is my chain of thought on that: The VRR has a rather fixed-voltage power source available to it. [At least its black wire is at a regulated voltage.] If said rotor resistance is too low, when the VRR sends electric current to the rotor, it sends too much [current]. That [excess current] causes too much "magnetism" in the spinning rotor, which causes the alternator output to be too high. The purpose of the rotor coil is to form an "electromagnet". If there is no current through the rotor coil, there will be no alternator output at all, regardless of how high the engine rpm is, because there is no magnetism generated by the coil. David, the problem has been solved. Also, the 28 amp alternator does NOT have a coil in the rotor, it's just a large piece of ferrous metal. Martin tried to tell you this twice, I believe. Forest 1100 wrote: ... the 28 amp alternator does NOT have a coil in the rotor, just big permanent magnets. Martin tried to tell you this twice, I believe. Martin said no brushes, I think. He did not mention coils as such. Martin and Forest will please cite their reference(s) saying our rotor has no coil. I amended my previous post slightly, after having a closer look at my alternator stator on the bench and at the rotor, still in the engine. As I said the rotor is just a big chunk of ferrous metal. The black/white wires do lead to a coil, but it is contained within the stator housing, not in the rotor. It is a separate coil from the three coils that create our power source. That coil fits into the centre of the rotor and, when charged, creates a magnetic field in the rotor metal, which, I am thinking, magnifies the field cutting through the three current producing coils. All coils/wiring are contained within the stator housing. No wires go to the rotor. The "induction?" coil is regulated by the VRR to increase or decrease the output of the other three coils. That's the best I can explain it. 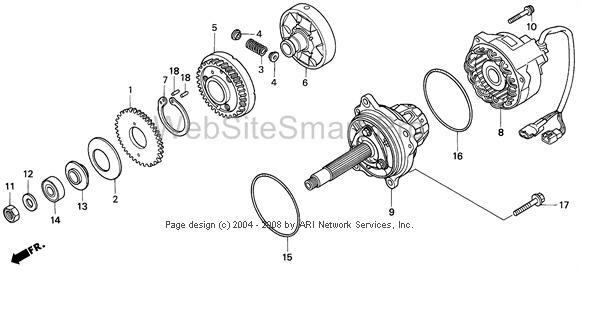 Martin has provided pages 17-1 through 17-6 from the Honda manual, the section on the Charging System/Alternator. Page 17-2 of it shows four coils but does not label them except to say that the wires leading to one of them are white and black. Page 17-3 mentions both "charging and field coils" in the alternator. Page 17-5 mentions the white and black wires again, in reference to checking the "Field coil line". Page 17-6 gives the resistance range as 0.0 to 0.4 ohms and does indicate that that component resides in the stator. So what I have been calling the rotor's coil should be called the field coil. Its purpose is to generate a magnetic field. Maybe it does not spin when the rotor spins; maybe the iron spinning around it is enough. In any case, I think a spinning magnetic field generates the alternator output in the three other stator coils which are fixed; they do not rotate, hence the terms stator (motionless) and rotor (rotating). Forest 1100 wrote: ... As I said the rotor is just a big chunk of ferrous metal. The black/white wires do lead to a coil, but it is contained within the stator housing, not in the rotor. It is a separate coil from the three coils that create our power source. That coil fits into the centre of the rotor and, when charged, creates a magnetic field in the rotor metal, which, I am thinking, magnifies the field cutting through the three current producing coils.... The "induction?" coil is regulated by the VRR to increase or decrease the output of the other three coils. That's the best I can explain it. Apparently the iron in the rotor becomes a spinning magnet because the nearby field coil is itself a magnet when current flows through it. Some may call the field coil the induction coil, but we maybe should prefer to use the term Honda uses. The VRR regulates the field coil in order to regulate the output of the other three coils. That's the best I can explain it, too. The expected resistance in the field coil is around 2.4 ohms, just going from memory.